Everyone seems to agree that Democrat Conor Lamb is closing in on Republican Rick Saccone in a special congressional election in Pennsylvania’s Trump Country. For many reasons, the March 13 congressional special election in southwest Pennsylvania should be a yawner. Its venue, the 18th Congressional District, has been trending toward the GOP for many years. The Republican incumbent who resigned in December after it transpired that he was encouraging an extramarital lover to get an abortion, Tim Murphy, didn’t even draw a Democratic opponent in 2016 or 2014, and only failed to obtain 60 percent of the vote in the Democratic wave election of 2006. And unlike previous Trump-era special elections in historically strong Republican jurisdictions, there’s no obvious asterisk making this one perilous for the GOP. Last year’s big House special election, in Georgia’s Sixth, was in a district full of highly educated suburbanites that only went for Donald Trump by a single point. Trump carried Pennsylvania’s 18th District by 19 points. And in 2017’s other big Democratic upset, the special Senate election in Alabama, Republicans were yoked to a wildly controversial candidate who hated raising money, and who immediately became embroiled in a sexual misconduct scandal. Eighteenth District GOP candidate Rick Saccone ain’t all that, but he’s a reasonably orthodox and scandal-free candidate with a decent résumé, running against a first-time candidate, former prosecutor Conor Lamb. Unlike Georgia’s Karen Handel and Alabama’s Roy Moore, Saccone also has had a solid financial advantage, thanks to an estimated $9 million in spending by outside groups. And given the 18th’s close proximity to Washington and its “Trump Country” characteristics, the administration has also been able to fully deploy its stars on Saccone’s behalf, with half the Cabinet and the vice-president making appearances, and Trump himself preparing for his second visit to the district this week. You have to assume this pessimism reflects private polls by the Republican groups who are financing Saccone’s campaign. But the trend lines are pretty clear in the public polling as well. In early January Gravis had Saccone up by a 46/34 margin. In mid-February the same pollster showed Saccone’s lead as halved (46/40). At about that same time a Monmouth survey came out giving Saccone a mere three-point lead. And today Emerson College has the first public poll with Lamb in the lead (48/45). In any event, no one’s expecting a GOP blowout despite all of Saccone’s advantages. And particularly if Lamb wins, the contest could be the most significant straw in the wind we’ve seen yet of what might happen in November. No, the outcome won’t have any literal impact on the balance of power in the House come 2019: The 18th is about to be reconfigured as part of the Pennsylvania Supreme Court’s remapping of the state’s House districts to reverse GOP partisan gerrymandering, and will probably be significantly less Republican than it appeared to be in 2016. But if Republicans can’t win this sort of district, the list of competitive contests for November may need to be expanded significantly. And that’s not good for the GOP. According to the Cook Political Report, Republican-controlled districts already account for 45 of the 50 races they consider competitive. An even larger map of vulnerable GOP districts could spell disaster. 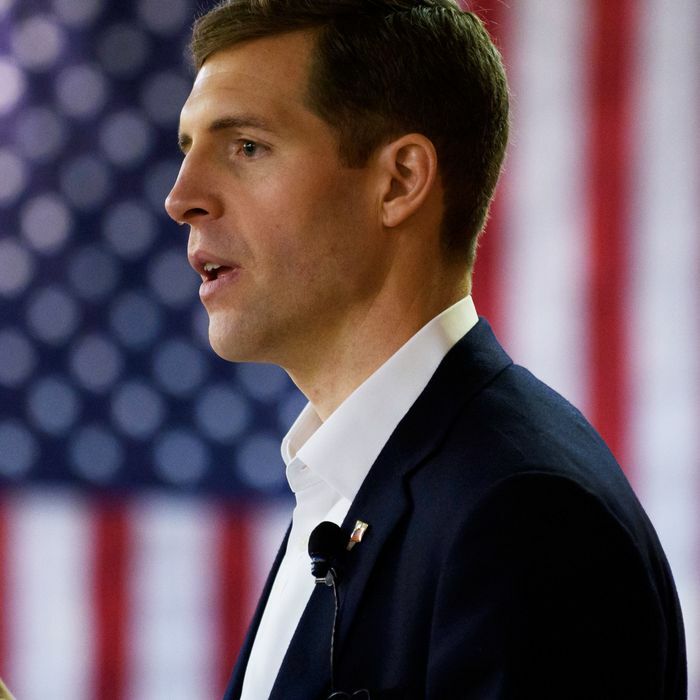 Coverage of the race has dwelled a lot on Conor Lamb’s careful centrism on controversial issues (he’s reluctant to embrace even modest gun control, he’s “personally opposed” to abortion) and his promise to vote against Nancy Pelosi as Speaker if Democrats regain control of the House. He’s also stayed away from Trump-bashing. If he wins, you can expect eager centrist Democrats to claim he’s found a template for victory in red states and districts. But the reality is that Lamb would not be in a position to reach out to the district’s small group of swing voters if not for the anti-Trump enthusiasm among Democrats that is giving them a turnout advantage. It helps that despite the 18th’s recent Republican voting habits, Democrats actually have a party registration edge, which means voting for a Democrat is not a completely alien experience. And unions that once routinely endorsed Tim Murphy are now backing Lamb. A turnout surge for one party can be especially crucial in special elections, where turnout for the opposition party is relatively low. There’s a week left in this contest, and it’s possible Trump’s visit (in which he is likely to brag about his decision to impose steel and aluminum tariffs in a district where protectionist sentiment has long been powerful) will make a difference, and that Democrats will have sharply raised expectations dashed the way they were last year in Georgia. But if a generic Republican candidate with massive party and White House backing can’t make it in a place like Pennsylvania’s 18th District, a lot of GOP candidates will have to reassess their self-confidence.